Government Area, Delta State, yesterday, invaded the Sapele office of Vanguard Newspaper , demanding for N100,000 on the alleged order of the council Chairman, Mr. Ejaife Odebala. 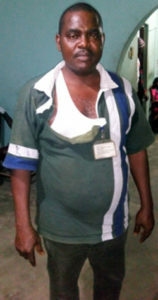 The invading council officials did not only beat up Vanguard’ S Correspondent, Mr. Godwin Oghre, his T-shirt was also torn. ascertained as at press time. They claimed the N100,000 amount was owed the council by Vanguard . minutes before the council officials came, pleaded with them to approach the headquarters of the company to make their demand known. Recounting his ordeal, Oghre said he was later dragged into a waiting 18-seater Toyota Haice bus with no number plates. times, but was not answered. workers on phone, but his plea fell on deaf ears. publication, which ought to be published today.